Vadra taking a lunch break at the ED office. Businessman Robert Vadra, the brother-in-law of Congress chief Rahul Gandhi, is being questioned in a money laundering case for the second day. 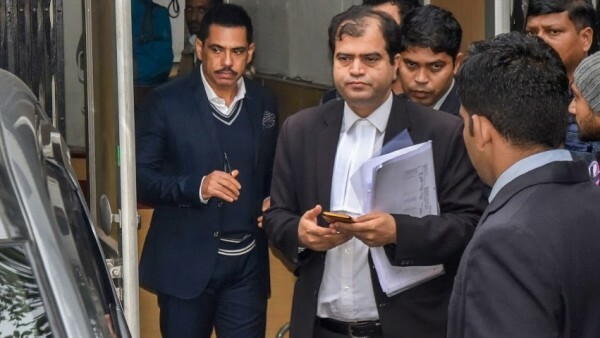 In a five-hour session, the Enforcement Directorate, the agency investigating the case, questioned Vadra on allegations that he illegally owns nine properties, cumulatively worth 12 million pounds (Rs. 110 crore), in London. The agency is now questioning him on his links with the main players in the case - controversial arms dealer Sanjay Bhandari, his nephew, and two others. Vadra has denied the allegations, calling it a political witch-hunt. Coming months ahead of the national elections, his questioning has become another flashpoint between the government and the opposition. Robert Vadra, brother-in-law of Congress President Rahul Gandhi, who appeared for the second round of questioning before the Enforcement Directorate (ED) on Thursday, was confronted with his mails that were exchanged with Sumit Chadha, a relative of absconding arms dealer Sanjay Bhandari, sources said. Vadra left the ED’s Jamnagar office around 1.30 p.m. He had joined the session almost an hour late at 11.20 a.m., although he was asked to appear at 10.30 a.m.